In Tbilisi, fashion is flourishing. The Georgian city’s Mercedes-Benz Fashion Week draws more crowds every season. A succession of concept stores stocking everything from emerging local designers to established fashion brands are dotted around its streets. And, over the course of the last few years, labels including Situationist and George Keburia have asserted themselves as ones to watch – not only in their native country, but internationally too (Bella and Rihanna have both declared themselves fans). Unlike many of the established fashion capitals, though, the conversation surrounding gender hasn’t really taken off in the city just yet, with only a couple of designers offering collections that moved beyond the binary. One of them is Aka Prodiashvili, whose SS19 offering was among the standouts at MBFW Tbilisi in November. The designer’s cast of androgynous models – many of them part of progressive Georgian agency Troublemakerz – slowly walked down the runway in leather trench coats trimmed with garish, tiger print fur, strapless cocktail dresses embellished with ostrich feathers, sequin-strewn catsuits, and silky smoking-style jackets, their faces painted with make-up that sat somewhere between high-concept drag and Dior circa 97. It was a bold step for a young designer living in Tbilisi, where being LGBTQ+ isn’t without its problems, and homophobia is felt on its streets often. But, alongside designers like Irakli Rusadze of Situationist – who included a number of non-binary models and a trans woman he met on the dancefloor of Bassiani a few days before in his show – Prodiashvili is intent on pushing things forward with his vibrant, imaginative collections. He’s clearly doing something right – having spotted his work on Instagram, Arca slid into the designer’s DMs last summer and the two have been collaborating ever since. Most recently, the progressive musician was pictured wearing one of his high-shine vinyl bodysuits and a pair of fetishistic, tricep-length gloves, which was “a dream come true”. Following his SS19 show, we caught up with Prodiashvili about how he got started in fashion, how clothing can be a form of protest, and who’s next on his list of dream collaborators. Aka Prodiashvili: When I was very young I started working on fashion shoots with some of the best Georgian photographers. I assisted on shoots for the likes of Vogue Ukraine, before eventually I started styling editorials myself. Before that, though, I was studying history of art. Why did you decide to make the leap from art to fashion? Aka Prodiashvili: Fashion was something that consisted of everything I wanted to do. I was working on music, I was drawing, I was painting… Fashion offered me the chance to do all of these things together. But I think I’d always been keen to work in fashion – I was interested in everything about clothing from a very young age. Aka Prodiashvili: I’m surrounded by the people that inspire me every day: the young artists, performers, and musicians that make up the new generation of Georgia. And of course, I’m always inspired by Björk, and Arca, who I’ve collaborated with. Sharing is so important in the arts, I think. You share something and someone shares something back with you and you both get inspired. You learn something from each other. That’s why, for me, inspiration will always come from different people. 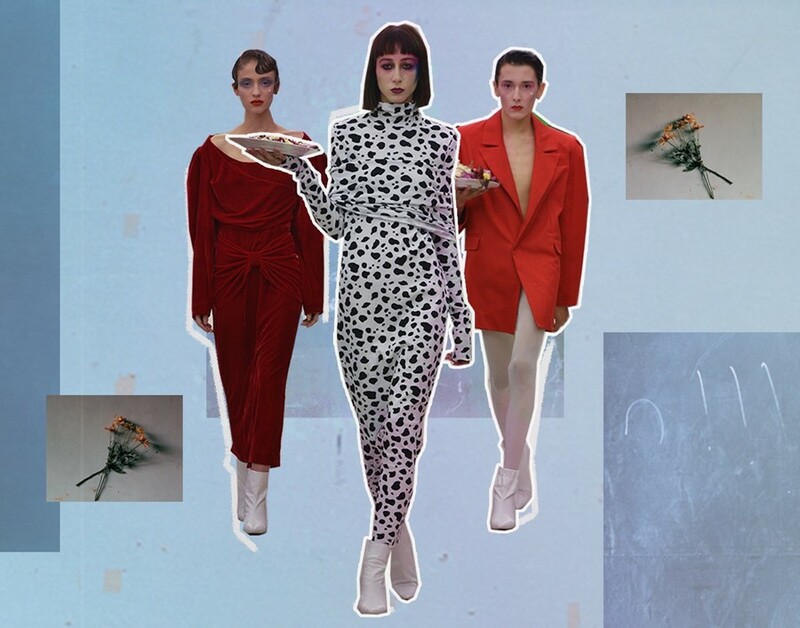 You’re one of the few designers presenting gender-fluid collections in Tbilisi. Why is subverting gender important to you, and have you run into any obstacles designing in that way? Aka Prodiashvili: The new generation growing up in Georgia are very open to these ideas, but still, it’s something that’s very new here, and of course people don’t understand it. The obstacles I’ve faced have been many, but I use the energy from those instances to keep going, and turn this bad vibe into something good. Homophobia is a big thing many people in Georgia face, but because I’m surrounded by these free-thinkers who are very open-minded, I feel like I’m kind of in this bubble, which makes me feel protected as I go about trying to change things. And do you feel things are changing? Aka Prodiashvili: To a certain extent, yes. It’s still a problem in Georgia, but not as much as it used to be. We are working very hard to protest these outdated views, and the more we do, the more the older generation realise it’s actually not as bad as they thought. We actually had a woman, a lesbian woman, running for mayor, which would never have happened ten years ago. We’re an ex-Soviet country, so it was always going to take us a long time to change things. But in comparison to other Soviet countries, I think Georgia is doing very, very well. What was the inspiration behind the collection itself? Aka Prodiashvili: I actually did everything very fast, I only started on it three months ago. But this is something I always had in mind, so from the start I kind of knew how I wanted things to be. The main inspiration was the lifestyle of a drag queen, infused with a Baroque sensibility. Is there anyone else you’d love to collaborate with? Aka Prodiashvili: Sasha, Violet, Anohni. What’s your favourite piece from the SS19 collection? Aka Prodiashvili: The grey dress with the butterflies. The represent freedom to me, and, because they don’t live very long, it reminds me that things happen very fast in our lives, and that we should make the most of the time we have. What will your next collection be about? Aka Prodiashvili: I don’t know yet. I suppose it will be a reaction to whatever the next problem is in Georgia, as a way to keep trying to make things better. What are the biggest problems you want to tackle through your work? Aka Prodiashvili: What happened at Bassiani last year still weighs heavy on peoples’ minds here. The people the police and the government targeted – the photographers, the designers, the artists – are the people that are trying to make this country better. It was a really sad moment, but it was also a provocation, for us to keep fighting. So, whatever comes our way, this generation is ready to fight for what they believe in. And I’m going to keep fighting with my collections.